When I’m traveling, I like to seek out charming hotels. When I can, I like to stay someplace that adds to the vacation rather than just being a place to sleep. 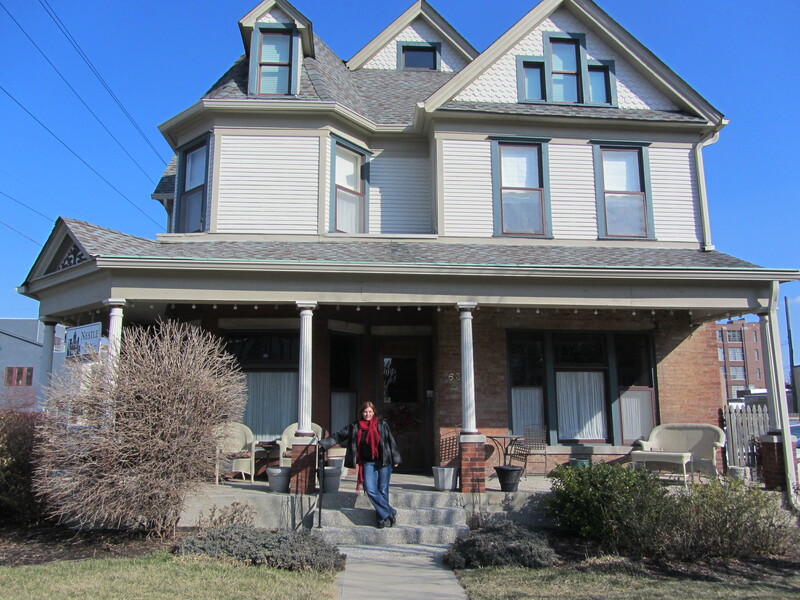 On my Indianapolis trip this weekend, I stumbled on the nicest Bed & Breakfast I’ve ever stayed. Granted, this is only the 3rd time I’ve stayed at a B&B, but it outshines the others by a mile. 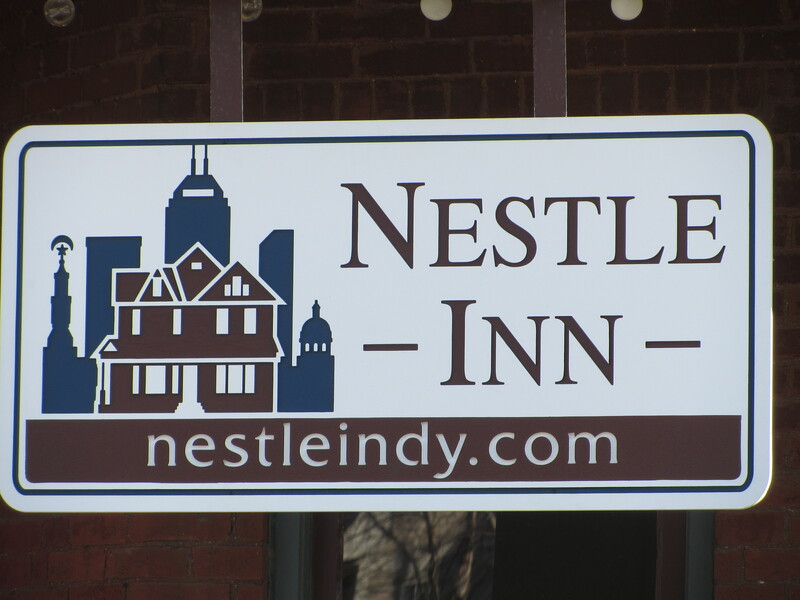 The Nestle Inn, pronounced Nessel, not Nest-lee, is in the heart of the Mass Ave Theater and Arts District. 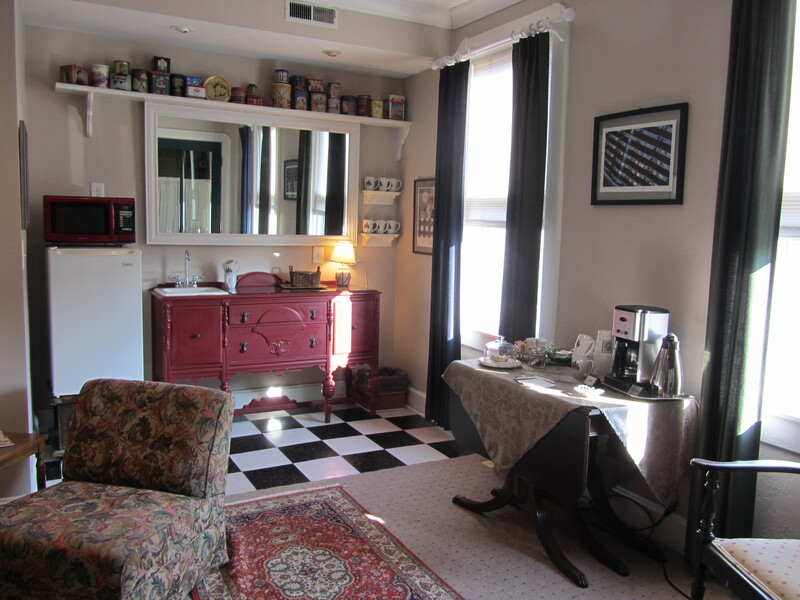 Just one block off the main strip of Mass Ave, the Inn is in the perfect location. We were able to park our car for free in the lot across the street from this old Victorian home…with no parking fees like there are in the downtown area. After checking in, we we able to walk to a theater, restaurants and plenty of pubs. The area felt very safe to us, and we didn’t hesitate to walk back after dark. But let’s back up and start from the beginning. This trip was very spur of the moment (read why here). We decided on Saturday to leave on Sunday. I didn’t have time to research anything, so we had no idea what we were going to do or where we would stay when we arrived. While I was driving, my friend Caroline was trying to navigate my iPad to figure out where we should stay. The cluster of hotels seemed to be in the downtown area and we liked the proximity to the Canal Walk. We were having a hard time getting through to anyone at the hotels so we decided just to drive over to a couple of hotels to check on the area and prices rather than making a reservation. When we arrived, on Sunday just after noon, we realized that the Indy downtown was not all that different from the St. Louis downtown. A convention center, several stadiums, office buildings…and deserted streets. Popping into one hotel, we also found higher prices than we expected and parking fees. 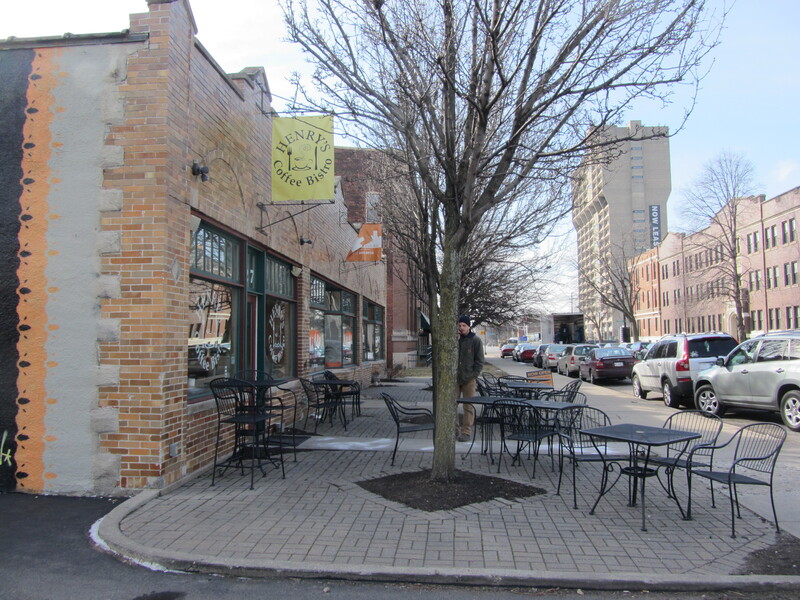 Deciding we needed an alternative, we headed over to plan B, the Fountain Square area. We were hoping for a vibrant urban community. What we found was a strip with a few bohemian shops and a few dining/nightlife options. We knew immediately that it wasn’t where we wanted to stay. We did grab lunch here at a BBQ spot and a manager sat down with us and used my iPad to help us figure out the rest of our day. We ended up in the Mass Ave district. The area has an urban energy and is very pedestrian friendly. 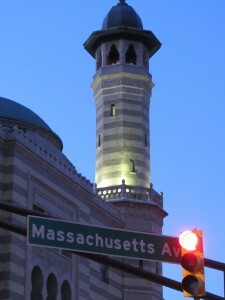 Massachusetts Avenue is lined with shops, galleries, restaurants and bars. There is also a comedy club, 6 live theaters and several venues with live music on the weekends. We ended up seeing a show at the Theater on the Square. It was a really small theater which made every seat in the house a winner. The crowd in Mass Ave is diverse…a mix of gay and straight, white and not-white, young and old. We saw a few people walking dogs and a couple of people who clearly lived nearby with kids. 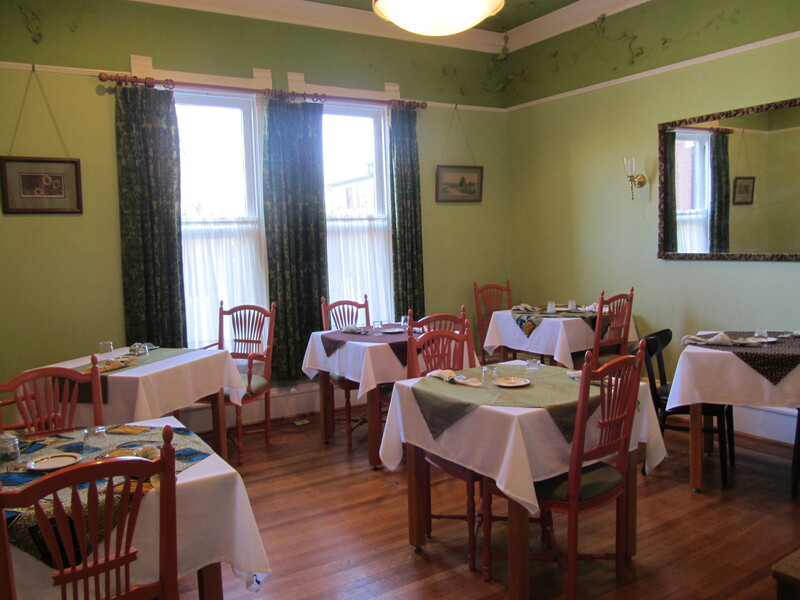 The area also is home to one fabulous Bed & Breakfast…Nestle Inn. 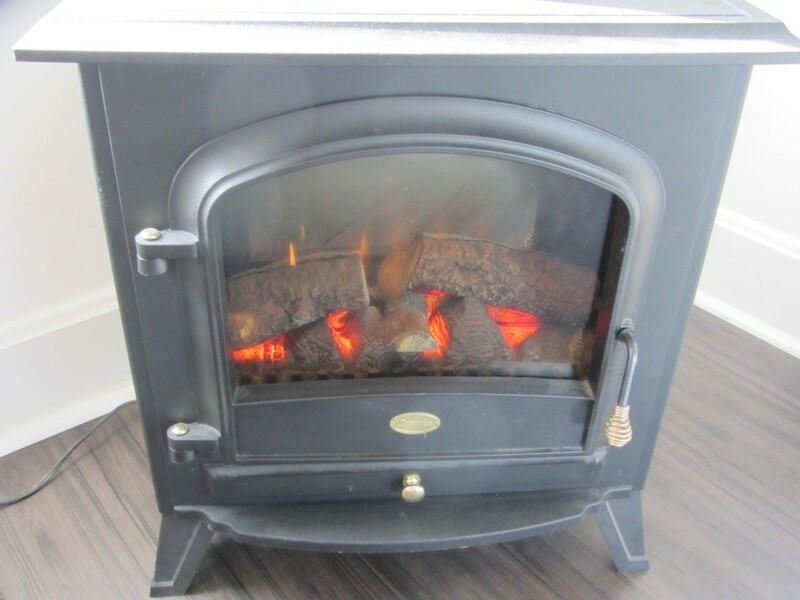 According the information provided by the hotel, the building was constructed in 1896 as a 2 family home by carpenter Jonathan Stewart and his wife Alice so family could live next door. Since the building originally was 2 homes, there are 2 wood carved staircases and different wood flooring designs on each side of the now single entrance. In 1910, the Stewarts moved out of the house and the house became a rental property. It was eventually divided into 10 apartments. In 2000, it was purchased and renovated. 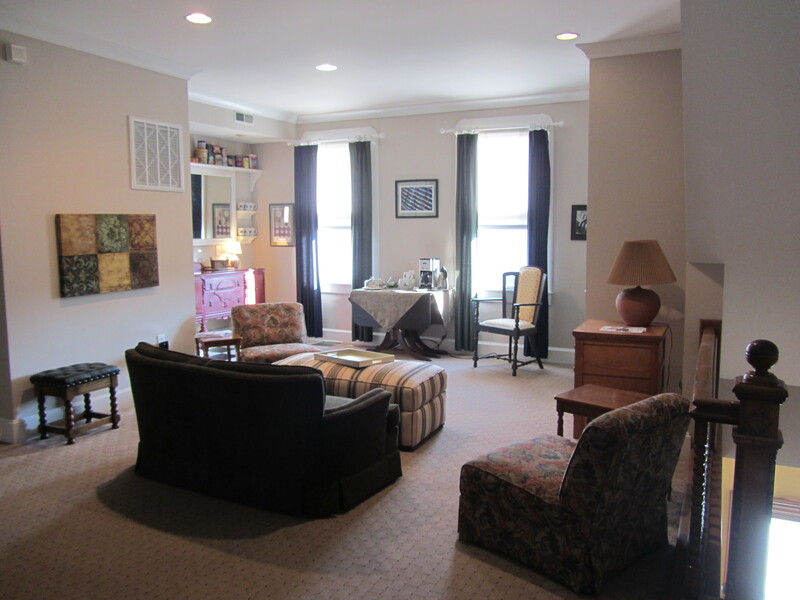 The 10 apartments were converted into one dwelling known as the Nestle Inn. 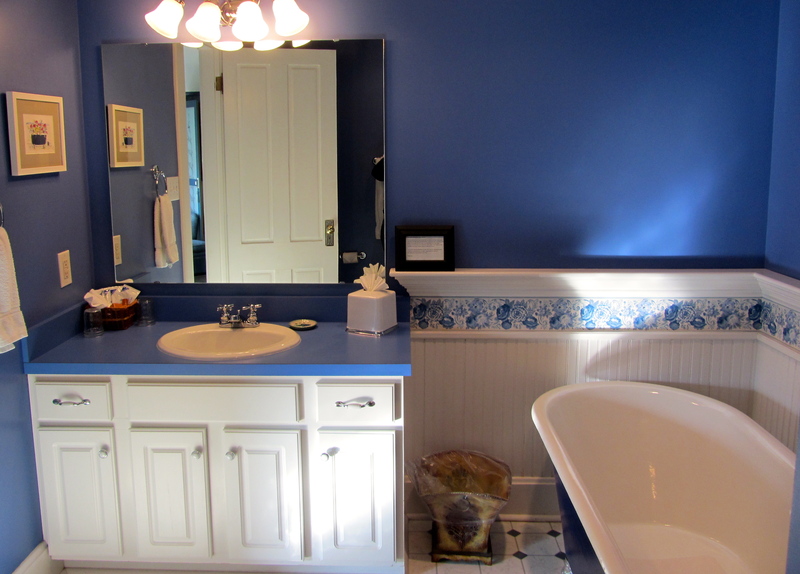 About 1 1/2 years go, Leesa and Robert Smith purchased the Nestle Inn and redecorated it. 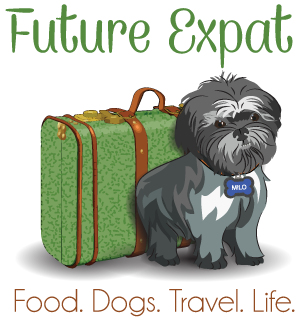 They cater to leisure, business and international travelers from around the world. The interior is charming and spacious. There is plenty of space where guests could gather together if they are traveling with others or if they just like to socialize with other travelers. Or, if you prefer solitude, with just 5 rooms and several separate sitting rooms, you should be able to find a public space to enjoy for yourself. This house would also be perfect for a family trip, girl’s getaway or retreat. I can imagine renting out the entire house and having everyone gather together in the family room outside of the 2nd floor bedrooms. The owners have a separate residence in the carriage house behind the building, so you really would have the house all to yourself in the evenings if you rented out the entire place. During the week, they provide breakfast vouchers for the cafe next door so you can go eat when you want. 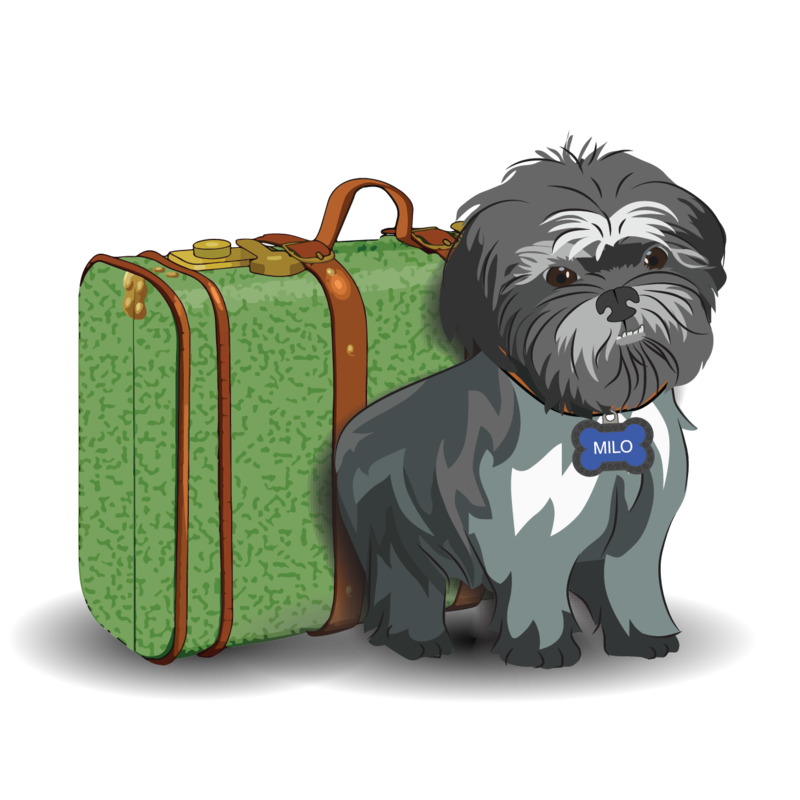 Leesa mentioned it works really well for their business travelers too, since they can get up and go when they are ready. On Saturday and Sunday mornings, they provide breakfast in the dining room. Since our only morning was on Monday, we didn’t get to try out their food, but I just have a feeling it’s really good as they have their own chef prepare the means rather than the owners just doing it themselves. 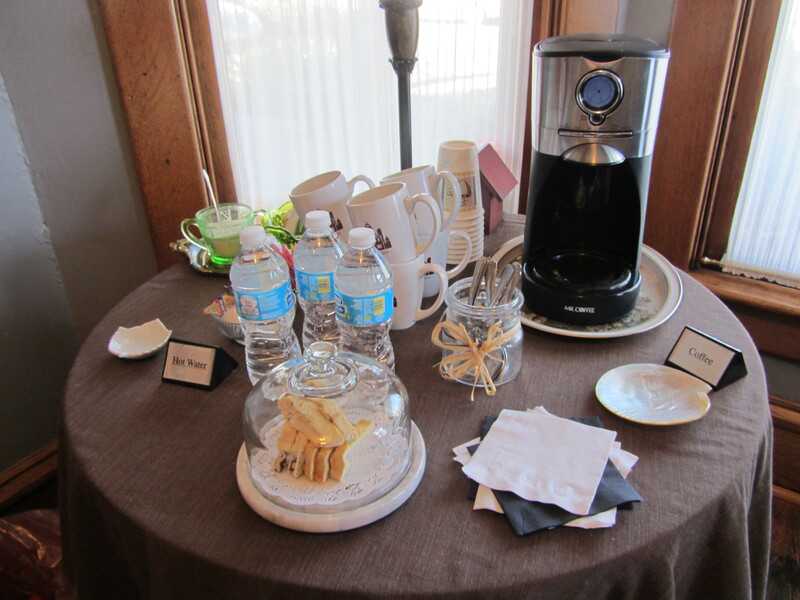 Typical of B&B style, they have bottled water, soda, tea, coffee and biscotti available to guests all of the time. And when we returned from our night out, there was a plate of sweets waiting for us in the front foyer. We needed 2 beds so we stayed in the suite. 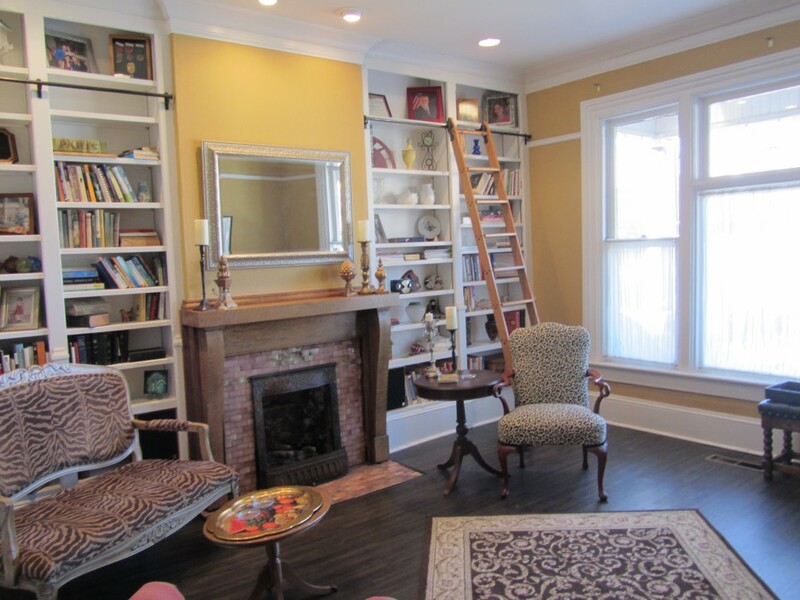 It has a cozy sitting room as you enter. This space has a daybed loaded with pillows that is designed for TV watching for those not needing the extra bed. There is a also a small desk in this space. Off the small hall connecting the sitting room to the bedroom is the bathroom. 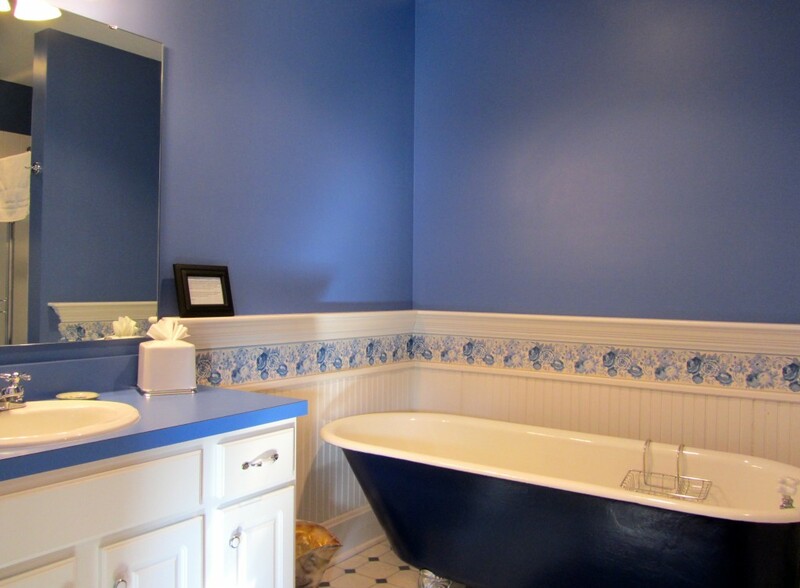 This room was clearly the master bath in the original home. It holds a claw foot tub, separate shower, vanity and plenty of space for 2 people to be in the bathroom at the same time. 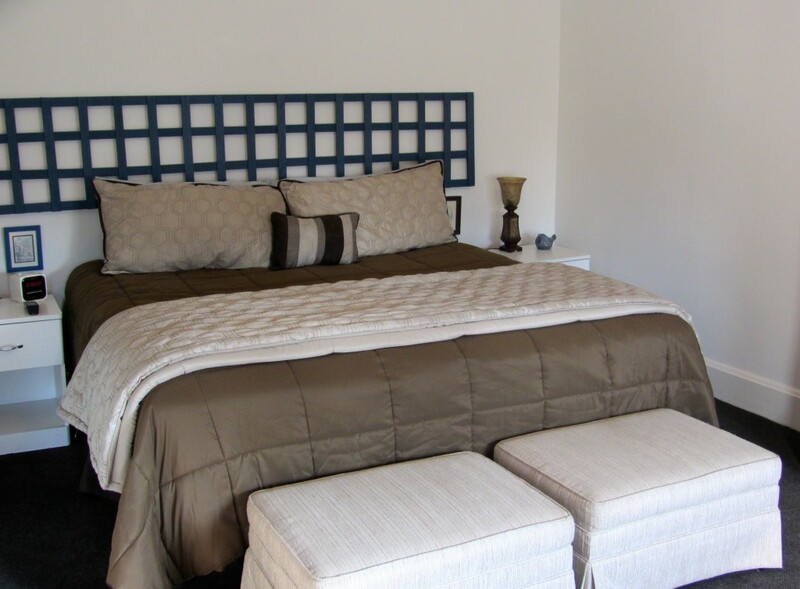 The king sized bed was very comfortable and has seating at the foot of the bed. There isn’t a dresser, but the wardrobe offered plenty of space to unpack if you are going to stay for more than a night. 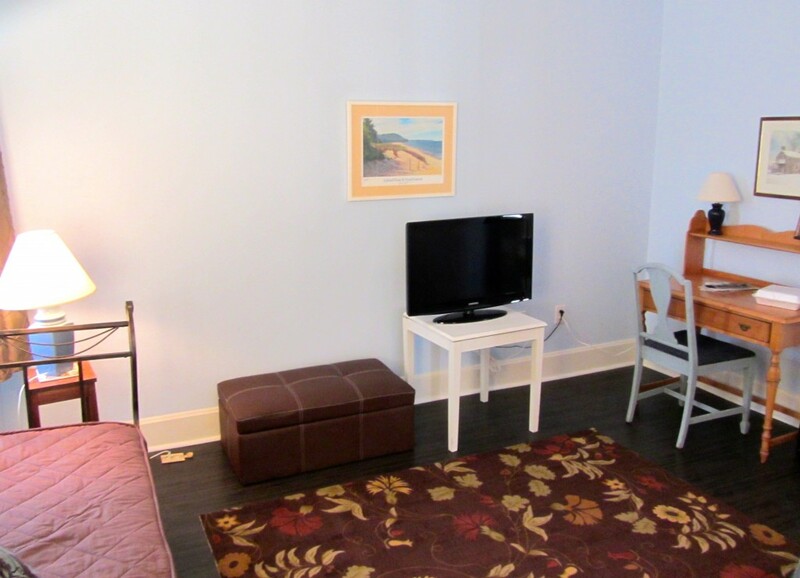 The bedroom has another TV plus an electric fireplace that can be used year-round since the heater can be turned off. Free wifi in the entire house also meant that while I started this post in bed on my iPad, I could have also gone into any public space to get online if I was staying with someone on a different sleeping schedule…or just wanted to relax outside of the bedroom. 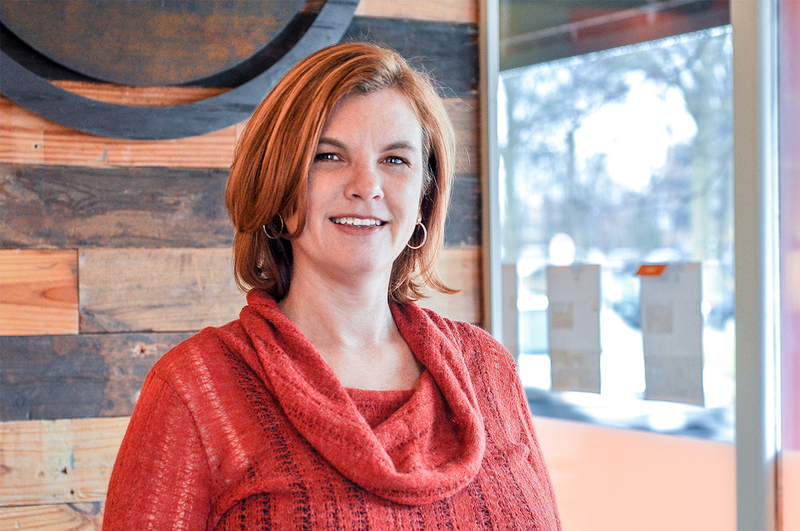 Before I left, Leesa was nice enough to sit down with me and share more about why she bought the Bed & Breakfast and why she thinks it has earned the #1 B&B rating for Indianapolis by Trip Advisor. Rates are very reasonable. They have one suite that sleeps 3 (king bed plus daybed) which runs $169-189, the king rooms are $149-169 and the queen rooms are $129-139. Plus, breakfast is included each day. Weekday breakfasts are provided next door at the Henry’s Cafe where you can order anything off the menu ($10 max per person). If you opt for something simple for breakfast like oatmeal or a cinnamon roll and coffee, you would have almost have enough left over to get lunch to go on the voucher. They also offer cooking classes on some Thursday evenings and Sunday afternoons. If I get a chance to go back, I think it would be fun to sign up for one of these classes and then spend the night. 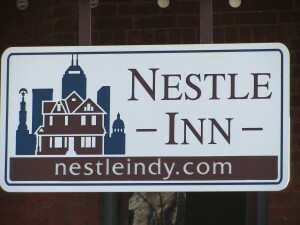 If you decide to visit the Nestle Inn, please let Leesa know that I sent you! Disclosure: The owner of Nestle Inn was nice enough to agree to our request for a discounted rate when we showed up at the door around 2 pm. I told her I was a blogger and that I would be posting reviews on websites too, but there was no discussion about content of this post or the reviews. My articles and reviews are my honest opinions about places I go and products I use.